Manchester United midfielder Paul Pogba was reportedly in court to address a speeding charge as he got hit with a £350 fine. The Daily Mirror report that the France international got in trouble for driving at 40mph in a 30 zone, leading to a fine and three points being docked off his license. Weirdly, the 25-year-old, with an estimated net worth of anywhere between £42.5-177million, according to Goal, was asked in court if he could afford the £350 fine, according to the Mirror. Unsurprisingly, the report states Pogba merely answered ‘yes’ to the question, which is perhaps just a legal formality, but it’s a little embarrassing when talking to a multi-millionaire. By Goal’s calculations, Pogba could in fact earn enough money to pay that fine back over the course of just over 12 minutes, so there you go. 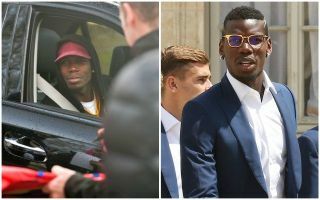 The report adds that Pogba was driven to court today, so it may be he’s taking a bit of a break from getting behind the wheel himself, which may be wise.